Through subtle digital manipulation of the body and facial features of her subjects, Lux creates eerie doll-like creatures with glazed eyes, porcelain smooth skin and subtly ill-proportioned forms. The resulting portraits contain an uncanny blend of mute childish innocence and the self-contained stoicism of adulthood. 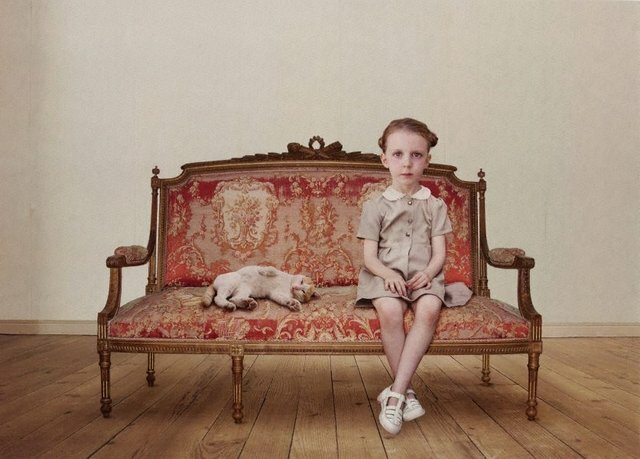 Lux’s images of children recall those of the old masters, such as Veláquez, Runge and Bronzino whom she cites as main inspirations alongside German photographer August Sander. Lux has stated in an interview with Louise Baring for the ‘Telegraph’ (UK) that she uses children ‘as a metaphor for a lost paradise’. Dressing her young models in past fashions (often of the era of her own childhood) suggests the child’s game of ‘dress ups’ in order to be an adult yet somehow played out in reverse. That is, Lux’s children do not seem like children at all, but rather like serious world-weary adults manifested in childish forms. Since 2000 Lux has had many solo exhibitions in the USA and Europe. Her work is held in numerous international public collections such as the Solomon R. Guggenheim Museum, New York; the San Francisco Museum of Modern Art; the Museum of Contemporary Art, Los Angeles; and the Fotomuseum den Haag, The Hague. In 2005 the artist received the Infinity Award for Art from the International Center of Photography, New York.